GCV Productions recently went behind the scenes to capture the magic that goes into a Boxer Super Shopper TV promotional production. Urban Brew TV Studios in Randburg was the location where all the glamour and glitz happened! Two of the lucky finalists won a brand new Ford Figo and the 8 others walked away with amazing household appliances ranging from fridges, to televisions and washing machines. GCV Productions was tasked with capturing the behind the scenes excitement for Boxer’s monthly Champ News Live Video for all Boxer staff countrywide to watch. Filming commenced on the Wednesday with a pre production meeting at Urban Brew Studios, crew and contestants. Auditors were present to make sure selection of contestants was done correctly. Contestants were taken into the studio so that they were able to get a feel for the bright lights and the excitement they would experience the following day. Thursday was an early start with arrival at the studio at 7 am. Filming of the contestants arriving at the studio and crew setting up studio was in full swing. Next was makeup and wardrobe for the contestants as well as the Show host Bongani NX. Andrew Mills, Boxer Marketing Director, made sure a tight schedule was followed, it was very important shooting of the TV show had to commence at 10 am. The TV show audience was briefed on what was expected of them while the contestants were taken through their final camera instructions. 10 am saw cameras going live…very exciting! Fun was had by everyone involved and GCV Productions was fortunate enough to capture all the excitement and fun for the rest of Boxer to see. Thank you to Andrew and his team for this great opportunity. The filming of the game show was a great success, look out for the TV show on SABC and ETV. 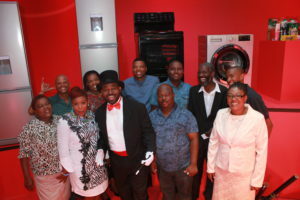 Below is Game Show Host Bongani NX and the 10 lucky finalists! Previous Previous post: Why a Training Video?